Here is a new title in Barron's growing My First Creativity Books series. A clever princess is needed to keep this kingdom in order. Connecting dots for royal surprises, solving kingdom mazes, decorating for a garden party and making a beautiful crown are some of the activities in this fun-filled book. Developed by educational experts to stimulate younger kids' imaginations, My First Creativity Books offer children many hours of learning fun. Illustrations include 28 pages in color. This was a great book filled with some great activities placed within it. My daughter had been ill and his was the perfect book to help her through her illness. She loved the mazes as well as the stickers but beyond that there was so much more that kept her engaged and entertained throughout this and provided hours of fun. 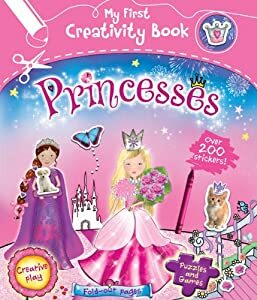 This book will provide your princess to be with hours of fun too!